With all of our errands, work, driving to and from Ohio, whole house audio setup, baseball games, home tours, cooking, cleaning, laundry, and life in general, it feels like we've not had any time to actually work on the doors for the vestibule project. We're getting so close to being done, but we're also into the tedious last steps of the project. After the last post about getting the new French doors sized and placed (sheesh, two weeks ago), we finally got moving on the crucial next steps this past weekend. One of the major steps towards a finished product was installing and glazing the glass I had cut for the French doors last month. But before I could get to glazing, I had to finish the prep work on the doors to get it into a place where I could actually install the glass. I wanted to make sure I got all of the cutting and sanding done before I started on the glazing. That last thing I want is for a bunch of saw dust to get caked into the glazing compound before it fully cures. Over the course of the previous week I had performed the final prep work necessary to get us into a position where we could do the glass install, so let me get you up to speed. 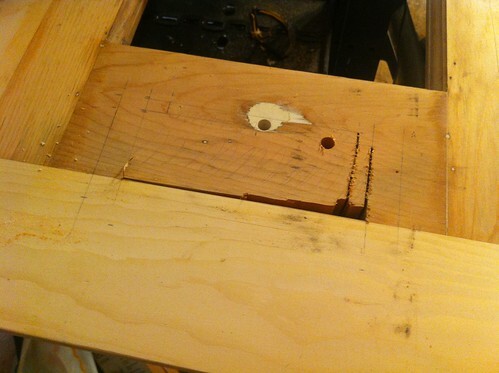 The first step was to do a final fill of all holes, gaps, crevices, and chunks that were still in the doors. These doors had seen their share of action as side lites to a front door, so there were a lot of small nail holes, dings, and missing portions of wood that needed attention. I used my favorite wood epoxy and mixed up batch to fill all of the problem spots on the door. I started sanding the door before the epoxy was dry (apparently 24 hours sometimes isn't enough), so I gummed up a few sanding discs before deciding to give it a break and just let the epoxy fully cure. After a "quick" two day dry and our return from Ohio, the door was ready for its final sanding. This final sanding also allowed me to make all of the wood between the old doors and the new extensions even and smooth. Once all was said and done, and the doors are painted, it will be tough to tell the old wood from the new. I sanded both sides of both doors with 80, 120, and 220 grit paper to give it a very smooth finish surface. 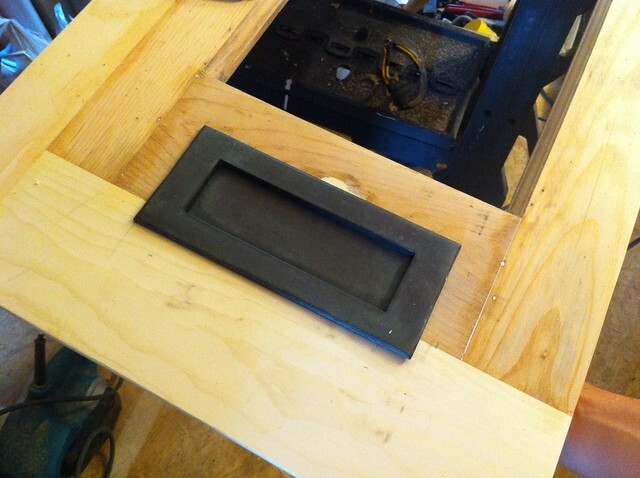 With all of the sanding done I moved onto mounting our old door's mail slot on the new door. The old mail slot is a brass and bronze (I think) mail slot that has some great old patina to it. Also, it is large enough to handle all of the catalogs, large letters, and the like that we tend to receive. The mail slot in our new front door is too small for much of the mail that gets delivered, so we needed an alternative or all of our mail will just sit in the vestibule. For this reason we wanted to put the old mail slot in one of the French doors so that the mailman could deliver to that door instead of the new door. Follow? Good. The actual cutting of the door was pretty straight forward, but cutting into something that I've worked for months to make "perfect" is always a little nerve-wracking. I've learned from past mistakes, so now I always measure 5000 times, mark everything with a pencil, and then hopefully cut once. Even so, I almost cut and installed it in the wrong door. Glad I caught that before the first cut. Here's the door cut location all marked and ready to be cut. 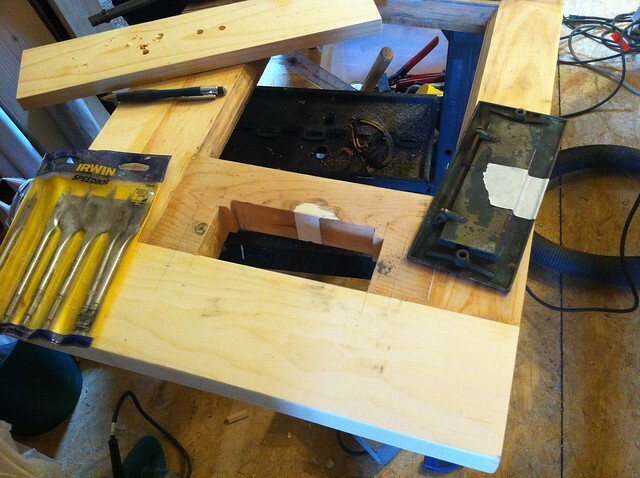 I always start cutting with the jigsaw by drilling a hole near the first cut with a 1/4" bit (or one that is large enough to have the jigsaw blade fit in the hole). Then I start cutting with the jigsaw. 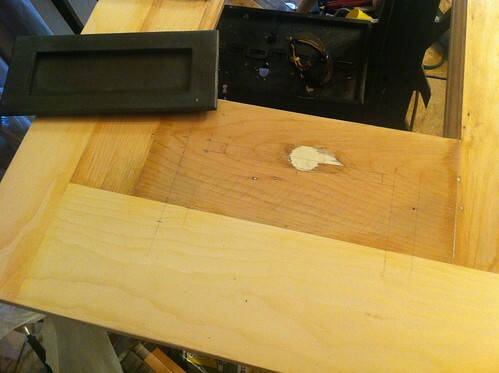 In this instance I clamped a guide board to the door to be sure my line was nice and even. I carefully cut away all of the material that I needed to remove, making multiple cuts where necessary to be sure I didn't make a mistake. 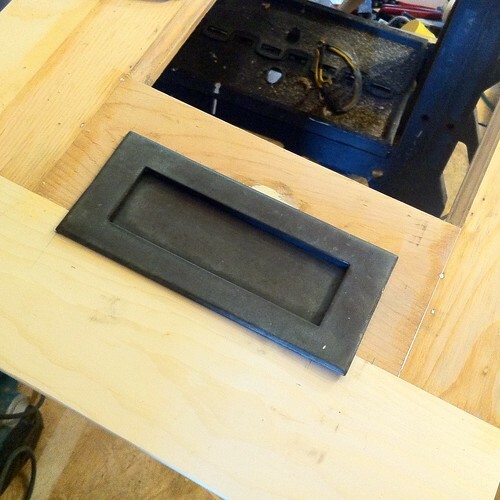 After several minutes of agonizing fear that I would make a mistake, the new mail slot hole was cut and ready for the mail slot test fit. 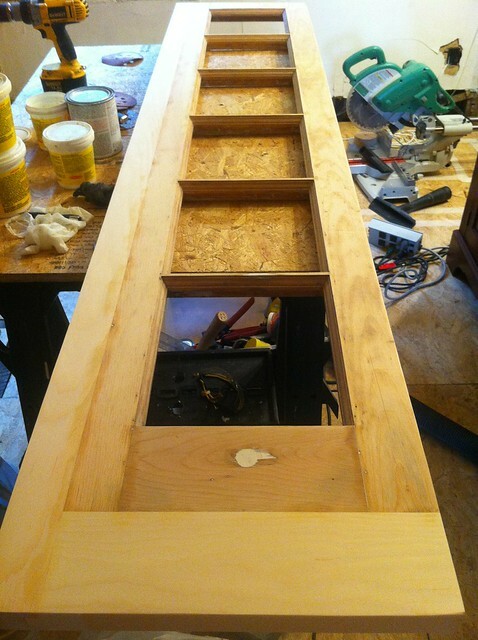 Once the mail slot was mounted I could turn my attention to the next task at hand, priming the inside of the door. 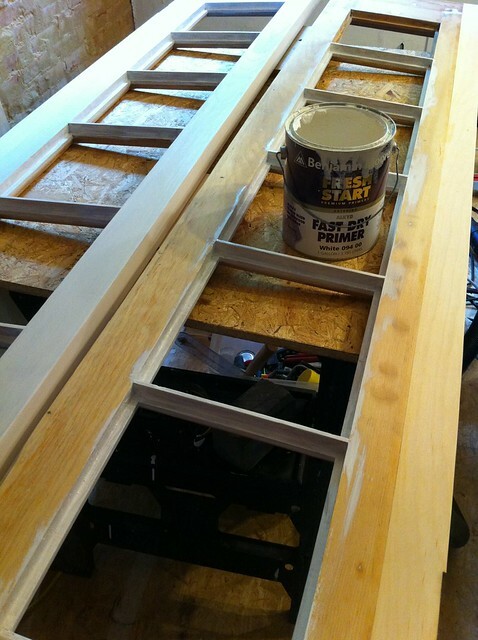 Since we are using standard glazing putty for the glass, it is best if the area where the glazing comes in contact with the wood is first primed. 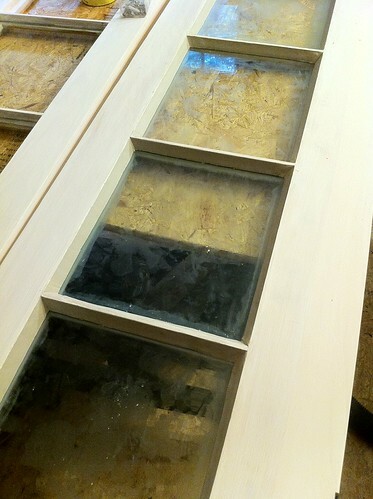 The glazing putty has linseed oil in it, and if left to be in direct contact with the wood, the linseed oil will seep into the wood and dry the glazing out prematurely. This will leave the glazing to dry and crack, failing far sooner than it normally would. Various manufacturers give different advice, but it is always best to prime your sash or doors that you are glazing BEFORE you glaze. I use an oil based primer in this situation to ensure the best possible protection. I had to give the paint four hours to dry before I could start with the glazing, but once it was dry I jumped to the tedious glass installation process. "Why tedious?" You may be wondering... Because I'm obsessive and crazy slow. No joke. I've seen people who can glaze a small window like this in under 5 minutes, and it looks great. Me, no way! Each one takes me at least 20-30 minutes. 12 pieces to glaze, 20-30 minutes each, yep, that's about six full hours of glazing. For this glazing install I'm using Sarco's Dual Glaze putty. It is much easier to work with than the Dap 33 you see in most stores, but it skins faster for painting. After a couple hours of effort, I had one of our two doors completely glazed. Unforutnately, I didn't order enough putty, so I had to order more this weekend to complete the project. Oh well, at least I'm half way done and the door that is done is looking good. Unfortunately I ended up breaking one of the pieces of glass. I wasn't being as careful as I should have been and put too much pressure on the glazing point. Luckily, I have a small piece of spare glass that should be big enough to replace the broken one. It sure is frustrating to have breakage this late in the game, that's for sure. I'm going to keep working on the glazing this week, but once it's all in I will need wait for at least a week or two for the glazing to skin over before we can paint. I'm going to be using a special paint for this application, so stay tuned, it may be fun (or a complete disaster). We shall see. Do you have any experience in glazing? 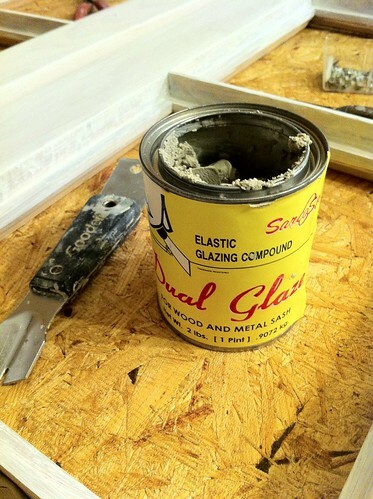 Ever have any desire to try glazing? Perhaps some tricks I can use to make myself a little bit faster at this tedious (for me) task? No experience with glazing whatsoever. Let's have a tutorial! I'm going to have to pull out the old cracked glazing in our front 2 rowhouse windows and re-glaze them, and I'm way out of my depth on that one. Zero experience. I'm terribly afraid I'm going to crack one of the giant panes of old wavy glass, but the air just rushes in these things right now. The storm windows outside are ugly but preventing a 30% spike in our heating bills, to be sure. Hoping I can find a way to reglaze them where they are, because I can't take these windows out. I'll work on a little tutorial for later in the week. Takes me a long time but it looks pretty good when it's done. 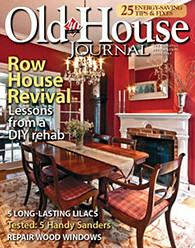 I worked in a window restoration shop for a summer, but I didn't do any glazing there, only removing old window putty. It's a shame I didn't use that experience to actually learn much. We're in a similar boat as you are. Our bedroom windows are loose as loose can be, no storms. They are the original windows but the glazing has started to fail on them. I need to take them out, strip them, remove the glass, replace the broken panes, re-glaze, and put them back in. However, right now we don't even have storms, I need to build those first. So I think I'm going to build the storms and put them in place, then take the sash out and do my work on them, letting the storms as some plastic work as the windows for a little while. Can't be worse than what we've currently got. The problem with all of this is how long good glazing always needs to cure before painting. Though with storms in you can glaze, then hang the sash and let it cure in place, then take them out again later to paint. I'm in the middle of restoring my first window sash, and I'm at the point of glazing. I bought a tub of DAP - I'm hoping it's good enough. This window is small, out of the general eyesight of visitors (upstairs, back of the house), and pretty well protected so I'm hoping it holds up well enough. What did you use to get your glazing so well shaped? I have a can of the DAP and have used it on interior transom windows where I don't mind waiting for it to cure. However, if I were you I would shy away from it. It works and looks fine, but it takes a month or more to actually cure to the point where you can paint it. You can order the better stuff online. I use a combination of my hands, a glazier's tool, putty knife, razor blade, and then the tips of my fingers. I'll do a little tutorial on glazing later this week so you can see just how easy (though time consuming) it can be. Sarco Glazing. You pass the test. When I saw glazing, I thought for sure, oh no this is where we part ways. But then there was that big fat yellow can of Sarco. Well done. The only thing better would be if you had some linseed oil and whiting and mixed your own glazing. This is excellent information, thanks for posting! Hah, thanks Brendan! I always strive to do things the right way. If I'm not doing the right thing (or at least attempting it) it's probably because I just don't know better. This is my first time using the Sarco products, but I've been waiting to use it for a while, just needed a project. I used to use DAP, but I think they changed the formula and it is impossible to work with now. Besides, I've just never liked it for an external window, and that is what these essentially are. I've actually not been to that forum, so thinks for the link. I just looked through all of the pages, tons of great information. What epoxy do you like to use for wood filler?